Clearly the world doesn’t NEED another food blog. But you know what? I don’t care. The world doesn’t need a lot of things we make (you know, like packaged pre-made cookie dough next to the milk in the grocery store, or ‘just add water’ pancake mix), so I’m doing it anyway. If nothing else, this will be my own little collection of what I’m eating and trying out. To be honest, I’ve been trying to eat healthier lately, including more vegan and vegetarian options, so I’m hoping to review my endeavors from the perspective of a somewhat normal American dietary perspective and share my successes (and failures, I’m sure). I also just have lots of opinions, so there’ll be some product reviews, recipe sharing with how I adjusted for my preferences, what wine or beer I really liked with dinner etc. Thanks for joining me, and please do participate in the comments! Let me know what you think about the products/recipes, and how you’d make them tastier, healthier, easier to cook for a group, significant other or kid friendly etc. See? You can have lots of opinions too. 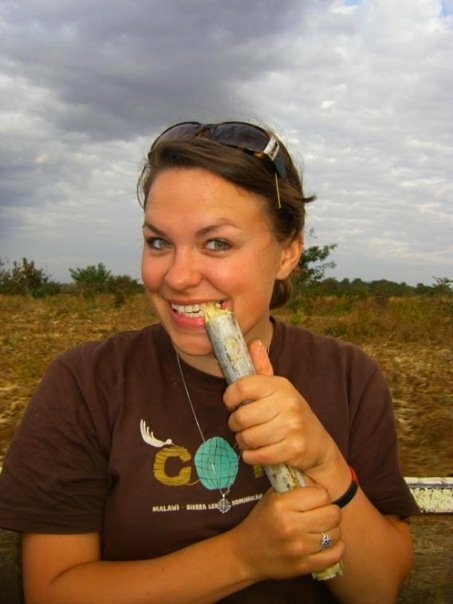 Just for the record, this is me (full disclosure: me in 2008 while in Malawi Africa) and here I am gnawing on some sugar cane, which if you ever get to try it, is (obviously) pretty delicious and fun to eat. So, I’m Amelia, and thanks for checking out CreativEating!